I love the folks who work at the National Park Service (NPS). They are selfless, dedicated to the nature and history of the parks, the people and most important, they love to share what they know. 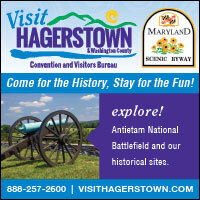 Much has been accomplished over the years by these unsung heroes to preserve our nation's battlefields. Often overlooked is the fact many park rangers are historians and educators. Below is an article written in 1941 by one of these men, Rogers W. Young, Assistant Historical Technician, Branch of Historic Sites. In this article, Young does a masterful job of presenting then Brevet Lieutenant Robert E. Lee's first assignment. Young's thorough research and engaging narrative style bring young Lieutenant Lee's personal side to light as well. By Rogers W. Young, Assistant Historical Technician, Branch of Historic Sites. 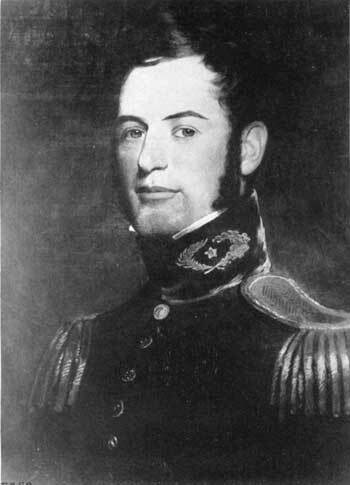 Robert E. Lee, a young Lieutenant of Engineers, U. S. Army, as he appeared about 1831, shortly after the completion of his assignment to Cockspur Island Signal Corps, U. S. Army Photo. The assignment to Cockspur Island, at the mouth of the Savannah, must certainly have held little allure for the young lieutenant of Engineers. The undertaking to build a fort on this marshy and isolated island was then of comparatively recent origin. The commanding officer on the island, Major Babcock, had begun his preliminary surveys in December of the previous year, and the project had been suspended in June 1829 for the hot months, while he was on leave in the North. A stupendous task yet awaited the superior and his youthful subordinate. 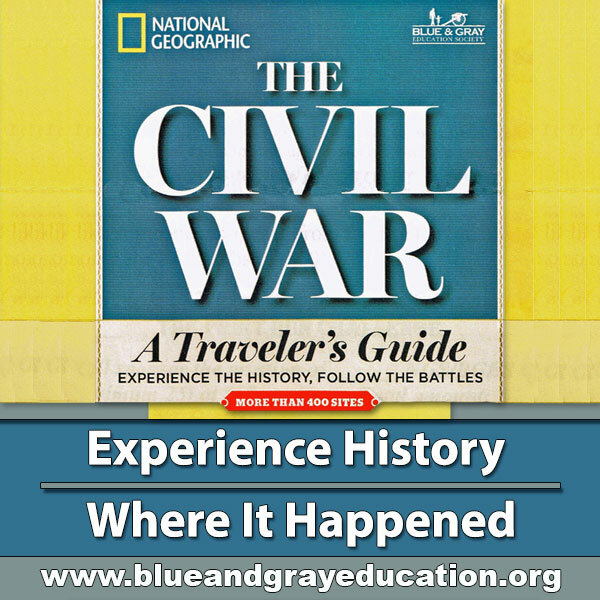 But orders were to be obeyed, and, on September 27, Lieutenant Lee notified General Gratiot that he would remain in Fauquier County until late in October, when he would depart for Savannah. Major Babcock reached Savannah on December 23, 1829, and the project, still in a preparatory stage, was soon resumed. Lee's superior, whom he now met for the first time, was an aging officer in the Engineer Corps. A graduate of the Military Academy in 1808, Major Babcock had already seen some 20 years of active service on widely scattered projects and was now tiring rapidly. Apparently his health was then in a very poor condition. Under such circumstances, the first officer to assist him with the Cockspur fort project would be expected to shoulder a large share of the responsibility. Facsimile of the War Department copy of the Army's first orders to Robert E. Lee, after his graduation from West Point, which assigned him to duty on Cockspur Island. The first paragraph relates to Lieutenant Mason. National Archives Photo. During the month of January 1830, Lieutenant Lee, acting in his capacity as assistant engineer, took over much of the direction of the work. Construction of quarters upon the island for Major Babcock, the workmen, and himself had to be rushed. A system of drainage and embankments for the island was commenced. Construction on the principal wharf was started. 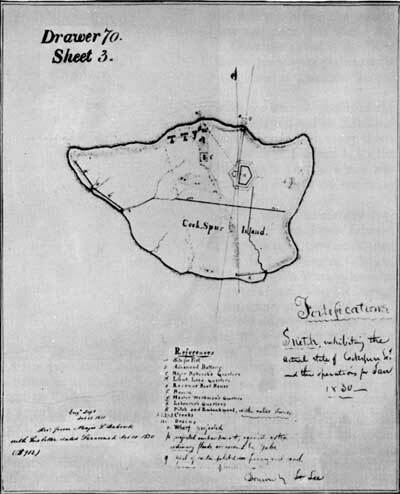 As the month closed, the 22-year-old lieutenant was delegated to prepare a map, which he entitled "Sketch exhibiting the actual state of Cockspur Island and the operations for Jan. 1830." This sketch (of which a reproduction is included in this booklet), first of the rare Lee drawings made on Cockspur Island, was semitopographical in nature, and as its title stated, showed not only the work accomplished, but the work projected as well. The shore of the island was outlined, and marshy and high ground indicated. The partially finished quarters, the beacon, and the revenue boathouse were shown. Also indicated were the proposed sites of the fort and advanced battery, and the location of the projected wharf and system of drainage ditches and embankments. Opportunity for gaining practical engineering experience was thus first presented to the young lieutenant, and he did not fail to accept it, however difficult the conditions. Cockspur Island did not then, nor does it today, present an easy area for engineering operations. Essentially a mud and marsh island, containing a few low sand ridges, Cockspur demanded patience, skill, and strength from Lieutenant Lee. The stalwart young officer had a physique and mind equal to the task, however, and apparently trampled with little perturbation through the mud and marsh of Cockspur. His endurance in the chill mud and water, during the daily surveying routine is said to have been the everlasting wonder of a particular young lady in Virginia, who subsequently became his wife.3 These trying months on Cockspur must certainly have aided in the maturing of young Robert E. Lee to that calmness of purpose and quiet ability which characterized him in later life. Aside from the interesting fact that this sketch was drawn on Cockspur Island by young Lieutenant Lee in January 1830, it is of especial value since it locates the exact site of his quarters, as indicated by the block faintly labeled "d", immediately above the block labeled "c". Major Babcock, who seems to have been somewhat chary of praise, apparently had realized the ability of his young assistant by the end of their first month's association. While he characterized Lieutenant Lee as "in a measure inexperienced," he found the young officer "active and intelligent" and had already delegated to him one of the most important, difficult, and thankless of post tasks. On February 1, 1830, Major Babcock notified Col. George Gibson, Commissary General of Subsistence, that he had "appointed B[revet] Lieut. R. E. Lee of the Engrs. acting assistant commissary of Subsistence of the Post under my command." During February and March, in addition to his new responsibility, Lee carried on his routine engineering duties in connection with the development of the drainage and embankment system for the island. What leisure time as he found was occupied by trips to Savannah, with the pleasant social life of his friends there, and with preparing sketches and writing personal letters.4 Opportunities for such diversions became more rare, however, as the early spring advanced. Major Babcock's health was perceptibly failing day by day, and his young assistant's duties became increasingly heavier in consequence. 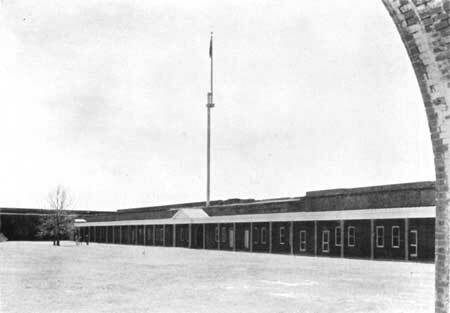 Progress on the construction of the temporary quarters reached a point early in May which allowed their occupation, and, for the first time, headquarters could be established on Cockspur. At the end of each of the months of February, March, and April 1830, Lieutenant Lee had revised his sketch of the condition of operations on the island, in order to show the progress on the buildings, the dikes, and the drainage ditches. From these can be traced the steps in the finishing of the officers' and workmens' quarters, the completion of the first main wharf on the north channel, and the beginning of the excavation on the proposed site of the fort. During these months, Lee gained much valuable experience in the handling and management of comparatively large crews of workmen, both white and black. 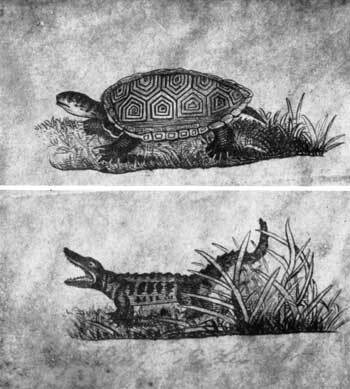 Rare sketch of the terrapin and alligator made by Lieutenant Lee on Cockspur Island. Copies of this sketch were apparently given by Lee to members of both the Mackay and Minis families, of Savannah, Ga., whose descendents still own the originals. 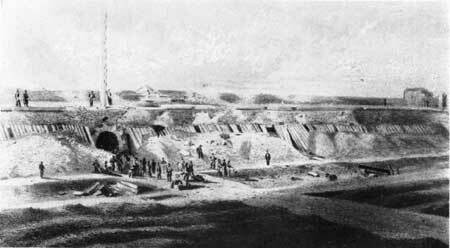 Operations on Cockspur during the early summer of 1830 were not to continue long after the establishment of headquarters there. Major Babcock had signified his intention, earlier in the year, of continuing the project throughout the summer, but early in July he informed General Gratiot, Chief of Engineers, that two of the "most eminent Physicians" of Savannah had recommended him "to remove as soon as possible" from the heat, fever, and mosquitoes of Cockspur and that he would "leave it with Lt. Lee forth with, agreeably to your instructions." Babcock was really quite seriously ill, and he left the island, never to return. Lieutenant Lee journeyed to Virginia, where he spent the summer with friends. Fortunately, these friends lived close to the home of a certain young lady in whom he had long had an ardent interest. The home was Arlington, the residence of George Washington Parke Custis and his wife, and the young lady was their daughter, Mary Custis.5 He apparently spent much of his summer eloquently improving his suit, and the necessity of returning to Cockspur in the late autumn brought an all too abrupt ending to such a pleasant vacation. He reached Savannah by steam packet from New York on the night of November 10. A bewildering condition on Cockspur confronted the young Engineer officer. When he had left in the previous July, the system of embankments designed to keep tidal waters off the proposed site had been nearly finished, and was intact, while many of the drainage ditches had been completely opened. But now a recent gale had created havoc with these works. The situation was one requiring immediate action, in order to save the project from irreparable harm. Lee had to face it, and alone, as Major Babcock had not yet returned from the North. Wartime sketch of the interior and rear wall of Fort Pulaski showing defense measures undertaken at the direction of Gen. Robert E. Lee on his last visit to the fort on November 11, 1861, to prepare the structure for the bombardment in April 1862; including the use of heavy timbers, or "blindages," earth embankments, and trenches in the parade to stop cannonbals. He did not hesitate in this exigency, but plunged immediately into the necessary repairs. The main embankment protecting the fort site was broken, and the dike erected "across the mouth of the canal that drained the ditches on the site of the fort," had been completely undermined and swept into the river. The main drainage canal was filled with mud and debris. The main wharf appeared damaged beyond repair. With the help of the small crew of workmen, left on the island during the summer, the young officer first made repairs to the main embankment, enlarging it for protection against future storms. This work was none too soon, as early in December another small hurricane raged up and down the Georgia coast. December 1 found much of the embankments replaced, and the reopening of the choked canals projected. 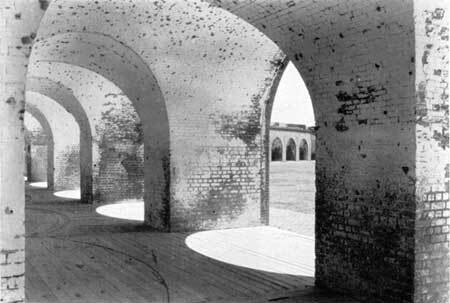 A view of the reconstructed portico along the rear wall of Fort Pulaski, the original of which General Lee directed to be taken down in November 1861, when he personally issued instructions to prepare the fort for siege. The concern apparently caused the young engineer officer by his superior's continued absence was shortly to be relieved. The Engineer Department, in a letter dated December 20, 1830, notified Lieutenant Lee that Major Babcock had been replaced as superintendent of the fort project on Cockspur Island by First Lt. Joseph K. F. Mansfield. Two days later, Major Babcock's resignation from the Corps of Engineers was accepted by the Secretary of War. Lieutenant Mansfield, who was hardly a year older than Lee, was 4 years his assistant's senior in point of service with the Corps of Engineers, and had already gained much experience with fortification problems at Fort Hamilton, New York Harbor; Fort Johnson, Charleston (S. C.) Harbor; and Fort Monroe, Va. Ordered "to take charge of the construction of the Fort on Cockspur Island Geo," on December 18, 1830, Lieutenant Mansfield, arrived at his post and assumed command on January 21, 1831. The new superintendent for the Cockspur fort now fell heir to the administrative disorder existing on the project as a result of the inefficiency of the commanding officer who preceded him. Poor, sick Babcock apparently had been very lax in his supervision of the project and had allowed his office routine and records to lapse into chaos. General fiscal affairs appeared hopelessly tangled. Office records were disarranged, or totally missing. Contracts had been made orally, or no record retained on regularly executed ones. Construction plans were conspicuously missing. Not having been charged with the supervision of the details which Lieutenant Mansfield now found in error, Lee could offer little assistance. He gave some aid, however, in untangling the affairs and in one instance presented his opinion in writing on the fraudulence of a timber contract. The Federal batteries on Tybee Island directed a converging fire on Fort Pulaski, a mile distant; the rifled cannon in the batteries at the mouth of Lazaretto Creek breached the wall's in 24 hours. Despite the general chaotic conditions, Lieutenant Mansfield took early measures to reopen operations on the island, which had now virtually ceased. On January 23, he informed General Gratiot that he had "directed Lt. Lee to make a Survey and Plan of the Island and the additions to it by Major Babcock, which with his zeal and industry will occupy but a few days and then the site and commencement of the body of the work will immediately be examined, fixed and take place." In the same letter, he brought to the attention of General Gratiot the necessity for a change in the original foundation plans of the fort, owing to the nature of the soil conditions on the island, and asked permission to design a new plan based on his own observations. A few weeks later, the Engineer Department authorized Mansfield to make a soil examination of Cockspur Island, instructing him to make a full report of his observations so that the Department could advise the changes thought necessary in the foundation plans. 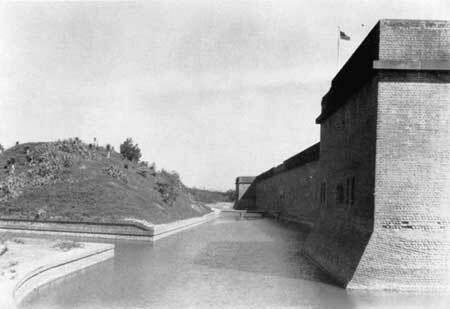 Rear wall of the fort, showing the moat, bastions, drawbridges, and sole entrance through the sally port. Since his survey work did not now occupy all of his time, Lieutenant Lee again began his trips up the river to Savannah. His friend, Jack Mackay, had in the meanwhile been assigned to duty away from the city. Of the three Mackay sisters with whom young Robert had spent many gay hours, Margaret was now married. Catherine and Eliza gave him the usual delightful welcome, however. Near by the hospitable old Mackay home, on Broughton Street, was the residence of the Isaac Minis family. Here two beautiful daughters always were glad to entertain the handsome young lieutenant from Cockspur Island.6 These charming hours in the spring of 1831 were numbered, as Lee was soon to learn. Meanwhile, on Cockspur the work of the survey and soil examination was producing results. On February 26, Lieutenant Mansfield reported conclusively that the existing soil composition would not provide a sufficient base for the fort's foundation, as originally designed. Shortly afterwards, the Department notified him that Captain Delafield, of the Engineer Corps, who was somewhat experienced with problems similar to that at Cockspur would be ordered to report to Cockspur at an early date for a joint conference. The survey of Cockspur Island undertaken by Lieutenant Lee was completed early in March 1831. He incorporated the results in a sketch entitled "Map of Cockspur Island, and position of Fort Pulaski," which was forwarded to the Engineer Department on March 8. 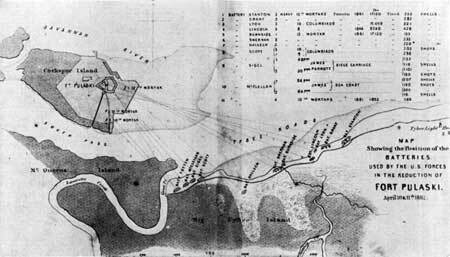 This sketch exhibited a thorough survey of the island, gave the high water line and fixed features of the terrain, showed the positions of the dikes, sluices, and embankments as actually existing, located all of the temporary buildings, quarters, boat houses, and shops, and clearly indicated "the site of the fort as laid down by Major Babcock." In addition to finishing this survey, Lee had been engaged also in the supervision of the new excavations for the foundations of the fort, a task which was to consume most of his time during the early part of April as well. 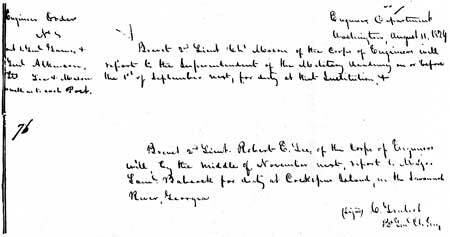 As March 1831 drew to an end, the Engineer Department apparently decided that as a suspension of the operations on Cockspur Island appeared imminent, there was no necessity for two valuable Engineer officers remaining in comparative idleness. The Engineer Corps was then very small, projects were many, and a vigorous young officer of Lee's ability was too valuable to allow his inactivity on Cockspur. Accordingly, on March 26, General Gratiot requested Mansfield to order Lee to Hampton Roads, Va., as soon as practicable if the project could dispense with his services. A view from the great brick archways of the casemates into the parade. Cockspur, Wednesday [April] 13th, 1831. There has been but one redeeming circumstance in the occurrances of [this] day Miss Eliza & that has been the arrival of your letter. Indeed I have been dreadfully harassed by these two men, who call themselves Engineers. For you must know that Capt. Delafield has arrived & is in high consultation about Foundations, Grillage, Piles & what not. And I have made them more little troublesome plans & worse calculations about weight, cost, etc. of Masonry, lime, sand & such stuff than I intend to do tomorrow, And that's the certain of it. Will you believe that they are still at it, & have just touched upon cranes, With "Lee give us a sketch of that?" But I happened to have my watch in my hand & seeing that it was ten minutes to 11 P. M. says: "Yes Capt tomorrow" And then I takes up this table & placed it by the fire, with pen ink & paper. And I will leave them to themselves, & they shall leave us to ourselves . . . But Miss Eliza, this parting with all in Broughton St. is dreadful . . . Perhaps, owing to Capt. D[elafield] 's arrival I shall be obliged to stay longer. Perhaps I can get to Beaufort. Perhaps your two weeks will be out next Tuesday, Perhaps I shall be taken sick. . . . I have not yet fixed upon the day I shall go or how . . . I have the honour to inform the Department that I have this day ordered Lt. Lee to proceed to Hampton Roads and report himself to Capt. Talcott for duty agreeably to the instructions from the Department under date of the 26 March last. Lee's first tour of duty in the army was ended, and he left Cockspur Island, more experienced, more mature, and better equipped for his duties, having profited by the practical problems he had encountered there. The days of his apprenticeship were over.